Still scratching a Star Wars itch, I moved on to Star Wars Vol. 6 - Out Among The Stars. It's a collection of single stories--an anthology--never before collected. I read the first story, Rebels in the Wild, and it was GREAT. I mean, really good. It went back to that time just after the Death Star was destroyed, before Leia and Han were an item and before anyone knew that Luke and Leia were blood family. So, there's that wholesome flirt thing happening between Luke and Leia. That's something we don't see a lot of--something that was only in ANH and TESB. It's nice how that complicated thought was brought to life in this comic story. And, there was action, too. When I saw the Walker rising out of the sea, it was a damn cool moment. Have to admit, that is a very cool pic. It's no AT-AT Swimmer from the Battle of the Golden Sun D6 adventure book, but you can't have everything. The implication in the book is that it didn't swim but walked along the bottom of the seabed. I started the second story, and it's just as good as the first one. I mean, really good. Can't put it down, good. Five Star good. It's a Lando Calrissian and Sana Starros story. I loved the Lando miniseries back when it came out. Lando really needs to have his own book. This story is really more about Sana. Lando is more of a sidekick in this one. But, that's OK. Sana is a new character, and she needs some fleshing out. This story makes her quite interesting. Finished this. Seven un-related stories, all of them gems. I started Vol. 7, Ashes of Jedha. It begins well. Really liking it. In Rogue One, my impression was that Jedha City was eliminated from the surface of the world, leaving a crater. The Star Wars version of the A-Bomb. This comic shows that Jedha has had about 20% of the planet completely destroyed--a big chunk of it missing. This would be a cataclysmic event. Nothing could live on the surface, even on the far side of the planet. But, this is Star Wars, and it is kinda cool seeing what's left of the partisans on Jedha fight the Dust Troopers in all that swirling sand storm. This is actually the second Vader series. 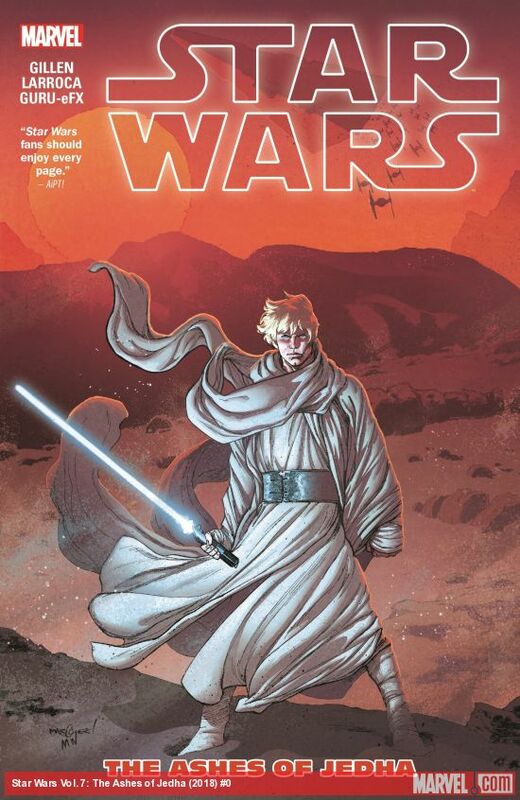 The first one began, along with the new Marvel main Star Wars series, right after the Death Star was destroyed. That Vader series birthed the new characters of Doctor Aphra, Triple Zero, BeeTee, and Cylo. Now, the series has come to an end. THIS NEW SERIES IS GOOD! It picks up the moment that Anakin Skywalker awakes in his armor at the end of Revenge of the Sith. It chronicles the first steps of Darth Vader. We learn something new about the Sith. They do not create their own lightsabers. They must take a saber from a Jedi and make it their own. The Sith blades are red and only red. Palpatine explains that the kyber crystals that power the sabers are living things within the Force. This is backed up by the Rogue One novel (it was either that or Catalyst). The crystals are rock, but they are also alive. In the hands of a Sith, the new owner uses the Dark Side to push all his pain into the crystal--until the crystal bleeds and turns the color of the beam red. I just think that is all sorts of awesome! I mean, seriously, how does a rock bleed? I guess they don't have the old adage about trying to get blood from a stone in the SWU...because apparently, that sort of thing actually does happen. I'm not sure how literally Palpatine meant it when he said it. Maybe it's what he calls it when the kyber crystal is forced to change colors. I think it's cool as hell, either way. Mystical. The Sith must take their sabers from a Jedi! Awesome! And, then that light saber is corrupted through the will of the new Sith user so that the blade color turns red. Maybe it's a reaction by the kyber crystal with the negative Dark Side being forced through it, or maybe the crystal really does bleed! Either way, I think that's some extremely neat stuff. While I can appreciate the idea of a Sith taking the lightsabers of his Jedi victims as trophies, I find the idea of Sith being dependent on Jedi to acquire their own lightsabers to be silly. That reduces the Sith from being badass villains to being codependent on the Jedi. And what happens if you're a newly trained Sith and you don't have a lightsaber yet? How are you supposed to get one from a Jedi who already has his lightsaber? Ask nicely for it? How are you supposed to fight a lightsaber-armed Jedi if you don't have a lightsaber yourself? Just how is a Sith supposed to separate a Jedi from his lightsaber without resorting to combat? Is the Sith supposed to surreptitiously poison an unsuspecting padawan and then loot the corpse or something? If the Sith have to kill a Jedi to get a lightsaber, that means that the Sith either don't have the means to create their own lightsabers or are unwilling to create their own lightsabers. That doesn't sound at all like the Sith; they're not that dumb to throw away the knowledge of creating their own weapons. Anyone who was that dumb or that prone to disadvantaging themselves wouldn't be badass enough to embody the Sith as we know them. While I can appreciate the idea of a Sith taking the lightsabers of his Jedi victims as trophies, I find the idea of Sith being dependent on Jedi to acquire their own lightsabers to be silly. Palpatine comments that it may be difficulty for Vader to find a saber after Order 66. That reduces the Sith from being badass villains to being codependent on the Jedi. 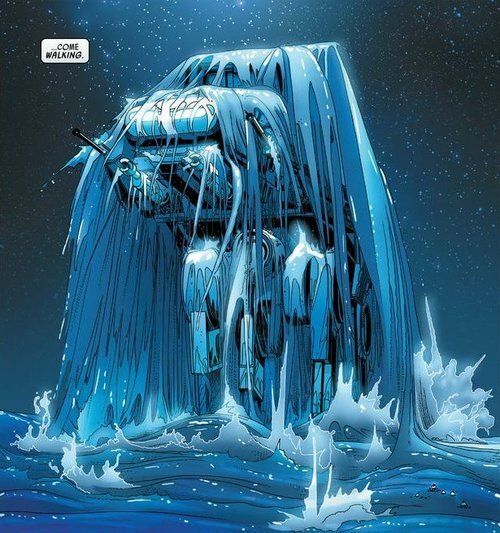 This type of thing is what turns Luke against the Jedi Order, wanting to wipe it all out. The Balance. The Ying and Yang of it all. Light and Darkness. Even on Ahch-to, there is balance. Bright Light, and that watery hole in the ground--the Dark Side--deepest darkness. This new Vader comic is bad-assed. If it continues to be as good as it starts, the book will take its place next to Doctor Aphra and Poe Dameron. And, we learn something new about the Jedi: the Barash Vow. Interesting. I would normally skip the adaptations. I see the films and read the novelizations. That's enough. But...hey. I just might have to get this one. As far as film comic adaptations, I only have the three classic trilogy Marvel adaptations. The headline for this article caught my attention since it refers Ackbar getting his moment and one of my complaints of the film is Ackbar's meaningless death. So I'd like to look at this but I'm sure I wouldn't buy it.